Relive the wonders and the charm of what the Phoenicians and Romans came to Sardinia for thousands of years. 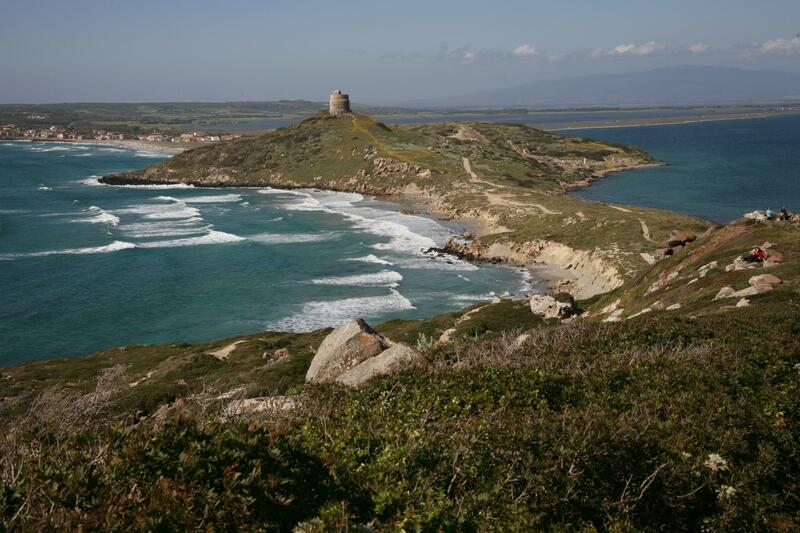 As the southernmost region of Sardinia, this was a key strategic location for trade and control of the entire Mediterranean Sea. Now, this is still true on a global scale for the Island of San Pietro in its Tuna fishing market, the Sulcis Peninsula for its wine production and the whole southern coast lined with beaches, as a mecca for summer tourism. Take this journey and see the remnants of the Punic Roman seaport towns and necropolis of Nora and Calasetta. See the endless summer villages down the coast and the unique Genoese style minor Islands of San Pietro and Sant’Antioco. 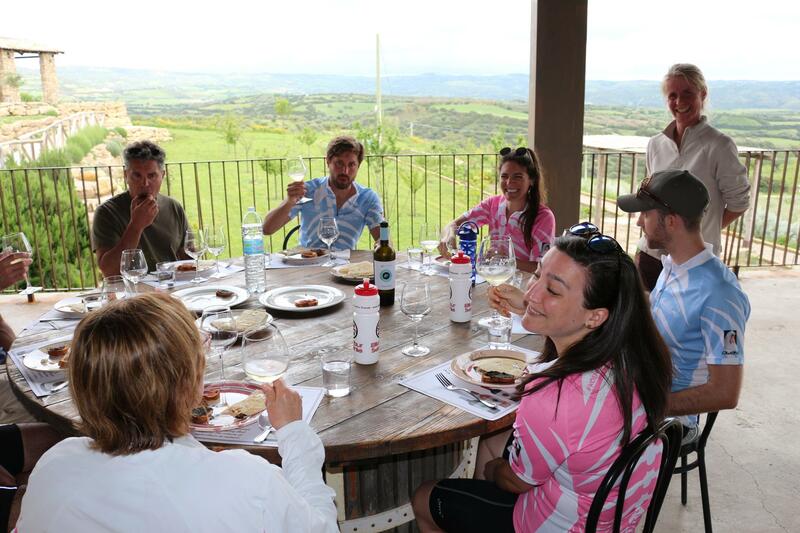 After all the cycling and exploration, indulge your hunger with the fine typical cuisines and wines of Sulcis Peninsula, which you can only find here. Cycle along the Green Coast riddled with old mining villages such as Nebida and Buggerru, where you will stop for a night of coastal wonders. 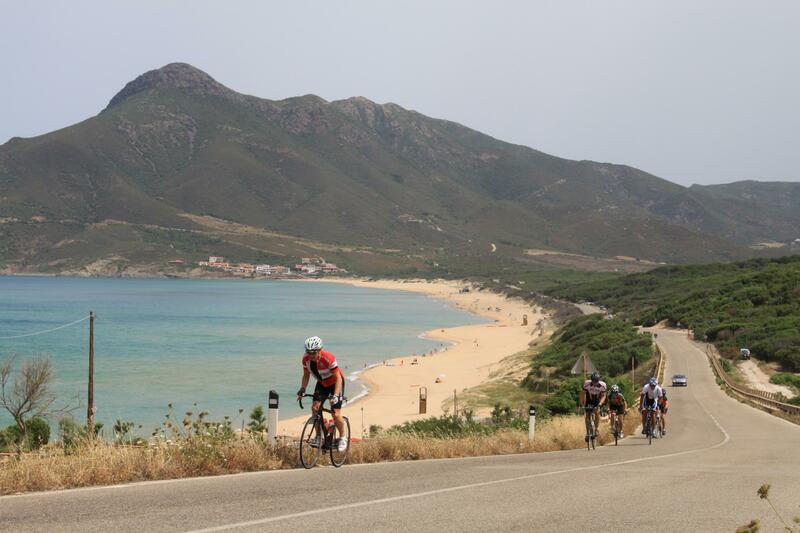 Continue along the southern coast for views of long sandy beaches and dunes bordered by pine forests and junipers before winding your way up one of the most scenic climbs of southern Sardinia up and over beautiful Mount’ Cidro towards your final destination and accommodation in Guspini, situated in the Campidano flats. 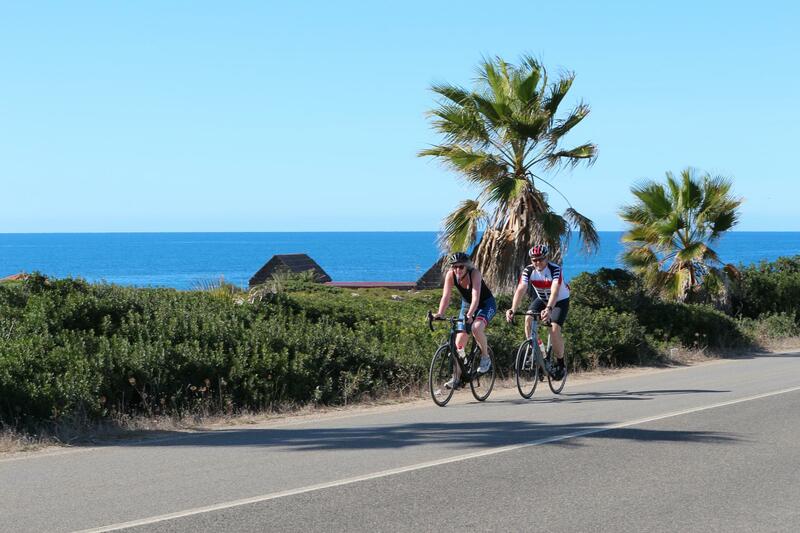 For those who want an additional day, we can accommodate you for a loop ride on the north part of the Costa Verde towards the beaches of Pistis and the dunes of Torre dei Corsari, or simply you can spend a shopping day in Cagliari reachable by bus or by train from Guspini. Meet and Greet in the afternoon, with Pure Adventures representative who will fit your bikes and introduce you to each day’s ride; with the possibility for a test ride to the shores of Nora: depending on your arrival time. Then enjoy a welcome gelato, together at the hotel bar. The Villa stands on the ruins of an ancient Campidanese house. In fact, it still holds the shape and the composition. In the late 90s, due to a collapse, the Villa was completely renovated and redesigned by Peter John Nappi, a designer of English origin, who re-proposed the Mediterranean architectural themes of the site. At the center of the structure there is still the typical internal court, in Campidanese style. The old original Sardinian bricks are re-proposed in the outer arches. These bricks were jealously guarded and recovered from the collapse, for their reuse. The name derives from the solar owner, now disappeared, Madau Madau. The Villa was subsequently purchased by the current owners, who run the hotel professionally and family-run. 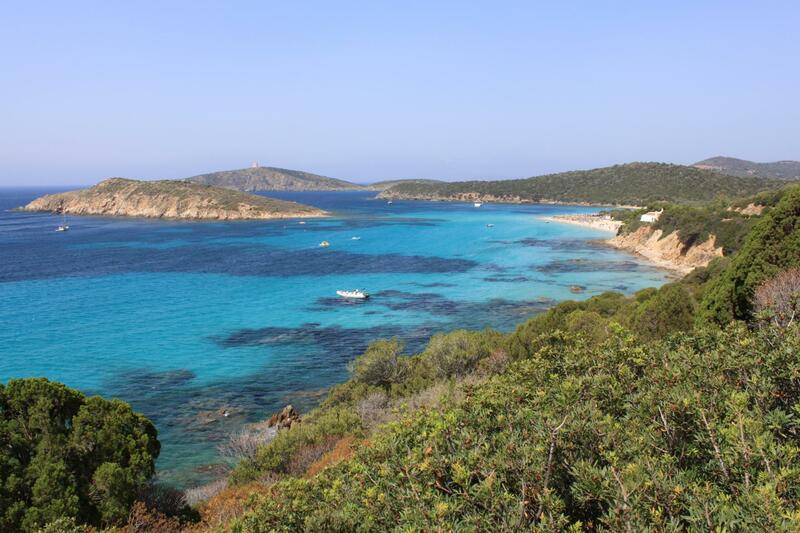 Cycling out of Pula along beaches and Spanish watchtowers, the crystalline water have a Caribbean feel, it is only the Mediterranean vegetation and in particular the juniper trees, “Ginepro” typical of this region, that reminds you are in Sardinia. After warming up on the flats, the rolling hills readies us for the coastal ride along craggy cliffs with ancient fortified watchtowers alternating with little sandy coves and long stretches of sandy beaches. On The last part of the ride you’ll descend to Teulada famous for the longevity of its inhabitants and for their history of achievements. Bike ride from Teulada to Calasetta via Sant’Anna Arresi or Santadi; take the ferry to Carloforte on San Pietro Island. Distance 57 km, ascent+277m. A long flat itinerary gets particular with pink flamingos and crossing a salt mine to the first minor island of Sant’Antioco connected to the mainland by an isthmus. Your cycling destination of today is the little fisherman village in Genoese style of Carloforte on the second minor island of San Pietro. Take the opportunity to explore the little and pretty village of Calasetta, just before taking the ferry to San Pietro Island. Carloforte welcomes visitors with its harbor busy with sailboats. It’s peaceful and quiet but at the same time is a thriving community offering all amenities with a lively and friendly atmosphere. 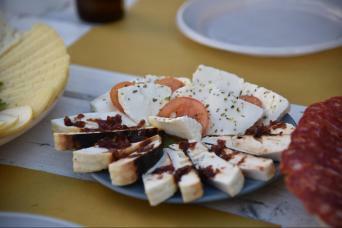 Here the particular cuisine is for sure a highlight not to be missed. Take a loop ride of Carloforte, dedicated to the old Italian King, Carlo Felice and famous for its maritime schools and Tuna fishing. Enjoy the openness of this minor island as you ride its wild rugged landscape seemingly in the middle of the Mediterranean Sea. The rugged geologic makeup and atmosphere takes you back in time and makes you feel like you are the first ones to explore this island. Once back in Carloforte, surly the local restaurants have a great lunch menu for you, as they are famous for their Tuna paired with the fine wines of the Sulcis. Leaving the minor island of San Pietro, Carloforte by ferry, you will arrive to Portoscuso to start todays ride. 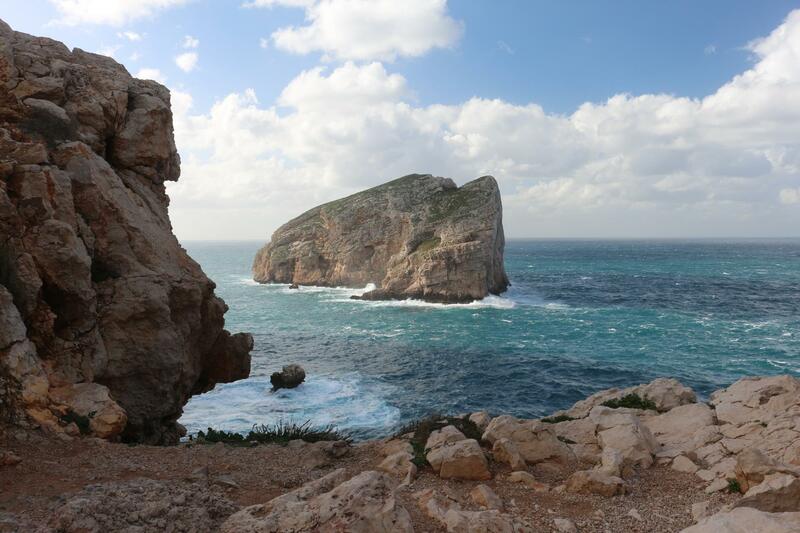 Out of the port, the next village is Gonnesa and then the fantastic uphill to Nebida, in front of Pan di Zucchero, an outcropping rock 133 meters high with two natural arches. Originally, all the villages of the area were created as mining villages. The mines no longer in use, some of them have been converted into museums such as Porto Flavia. Now skirt the coast: stunning views of long sandy beaches and rugged promontories connecting mining towns to mining towns all the way along the coast. Your destination for today is Buggerru, a little mining village in front of the sea with cliffs and mountains cradling it within its own gulf. 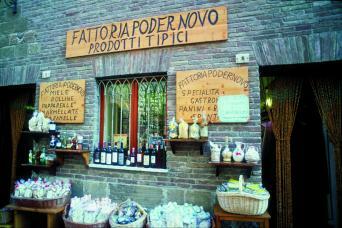 Here you can choose between some restaurants and don’t miss a good GELATO in the main square. After the village of Buggerru you reach the long sandy beach of San Niccolao and then you can stop in Portixeddu for a Cappuccino or a light snack. After 14 km you are warmed enough and can face the winding and scenic hills of Monte Cidro, a natural pass which takes you in direction to Arbus and Montevecchio, old mining villages. Make sure to take in the natural beauty of the landscape as you climb and cross the pass full of cork oak, juniper growing between jagged granite stone before taking the downhill into Arbus. The mine of Montevecchio is now an important site of industrial archaeology, part of the Geominerario Storicoparks and a Unesco World Heritage site. After reaching Montevechio, enjoy the winding and scenic downhill into the town of Guspini. Gourmet dinner included at hotel restaurant. Sa Rocca Hotel & Resort, located in the middle of Medio Campidano, amid green hills it’s a wonderful place to find serenity and relax. The complex encircled by the Macchia Mediterranea and by oak wood, offers to its guests an extensive choice of services. A luxury 4 Star Hotel of 21 Rooms, with Restaurant, Cocktail Bar, a brand new Wellness Centre and an Exclusive Fitness Centre. A refined Restaurant, a delightful Pizzeria, a Cafeteria refreshment room and an, Open Square for summer time dinners. A Sports Centre, furnished with 2 indoor swimming pools, dance and fitness halls, football grounds and beach volley courts. A Disco Pub, Billiard Room and Bowling. A park for children and Open Space to stage stands, concerts and shows. Option Depart: After breakfast end of tour. Bus, train in San Gavino Monreale, taxi or private transfer available to Cagliari or other destinations on the island. 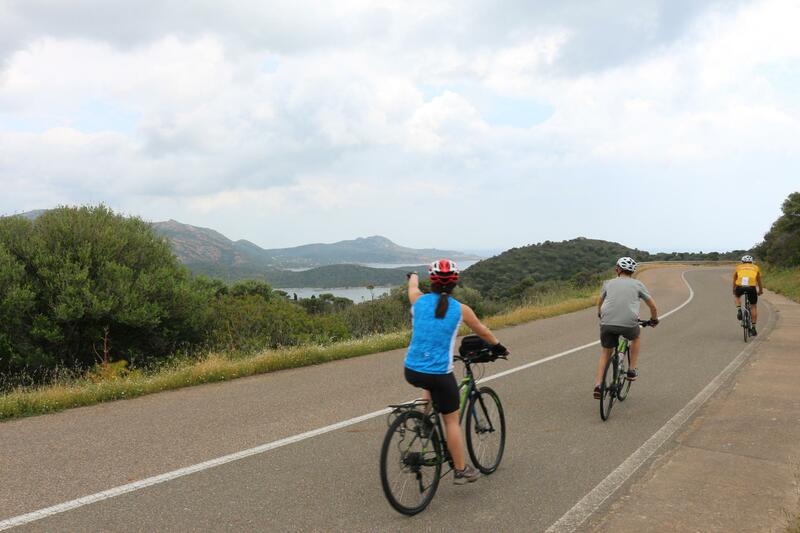 Optional Ride Day + Night: The Green Coast: Loop bike ride starting from Guspini towards Torre dei Corsari and Portu Maga. Distance 60 km ascent: +1210 m.
Rates are based on double or single occupancy with minimum group participation at 2 persons. Hybrid bike rental 168 euros for the duration of the tour; e-bikes rent for 252 euros, and road bike with drop bars is 216 euros. See bike & gear tab for details. Extra days and services for travel in Italy can be booked in combination with your tour booking; please inquire with us well in advance of travel. - The best way to get in Sardinia is by plane - but there are many ferries – from Civitavecchia (Rome); from Livorno (Tuscany): from Naples (Campania) ; from Genoa (Liguria) and from Marseille (france) that connect different ports in the island: Porto Torres, Olbia, Cagliari, Arbatax. Best airport for this trip is Cagliari Elmas. On the island of Sardinia, there are also Olbia and Alghero airports. The tour starts in Pula. The best is to fly into Cagliari, Elmas airport and take a train (one stop) to Cagliari center, the train station is very close to the airport (walking distance). Look for timetable in English at official web site www.ferroviedellostato.it . Or you can take a cab to Pula just 40 km from Cagliari airport. 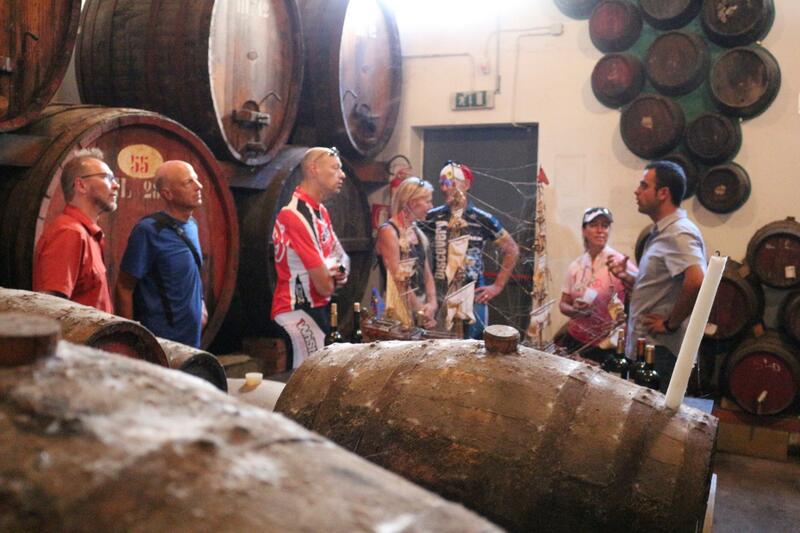 The tour ends in Guspini: You can take a taxi to Cagliari airport or bus to Cagliari train station. There are many buses during the day. Once in Cagliari station you can take the train to the airport, the ride is 6 minutes and the cost is 1,25 euro. Level: Level 3 Fit; terrain is rolling and distances while moderate. Dates: March 15 - November 30; avoid July and August. Best Time To Go: April - May, September - November. Mauro Mulas, Native of Northern Italy (Milan) and studied the history of cinema and photography in Milan. After studying, he spent a long period in Mexico, where he learned to do very good Pizza and Italian dishes in an Italian restaurant. His enthusiasm for the outdoors includes horseback riding, and he has a riding instructor, but he loves ski touring and Dolomites as well. Mauro’s passion for cycling has him on a bike year-round. Hybrid bike with disc brake: 168 euros Aluminum frame with carbon fork; Components Shimano Deore. 2×10. Hybrid bikes blend the characteristics of race bikes and mountain bikes. Hybrids typically have the flat, straight handlebars that provide a fairly upright sitting position and are designed to reduce shoulder and neck fatigue; a more upright position also provides more opportunities to view the beautiful countryside. Hybrid bikes are lightweight, with road wheels and narrow road tires for low rolling resistance allowing for greater speed and less exertion when riding on paved roads.Hybrid bike rental included in trip price. Pedals: flat or travelers may bring their own clipless pedals to have installed. If you bring your own pedals, please bring your own wrench to remove them from the bike at the end of the tour. Road Bikes are also available for 216 euros; e-bikes have are 252 euros.